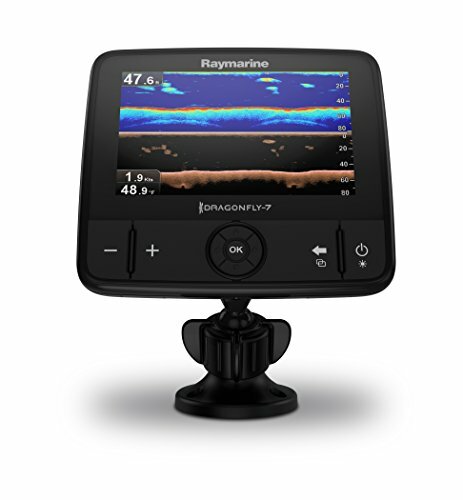 If you have had the passion for fishing for a while or just getting into the sport, then you surely know a thing or two about the Raymarine fish finder brand or have at least heard about them. Raymarine has been in the industry for quite some time. Over the years, it has built a solid reputation for itself. They design and create some of the best fish finders that are fitted with state of the art sonar technology as well as many other features such as GPS. 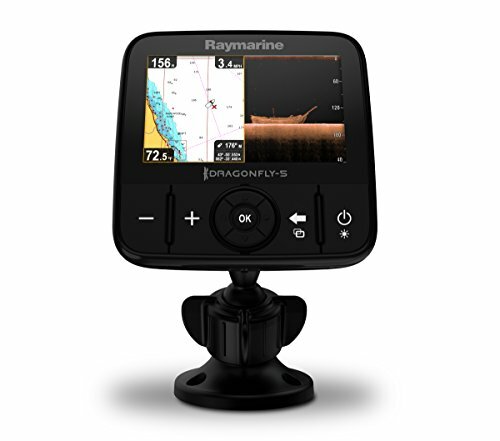 The Dragonfly Fish Finder series is proof that Raymarine can blend simplicity with high-end tech features. Among the features included are all-weather displays and CHIRP DownVision. The Sonars fitted in the Dragonfly Series (The Dragonfly 4, Dragonfly 4Pro, Dragonfly 5, Dragonfly 5Pro and Dragonfly 7Pro) allow you to spend less time looking for fish and more time reeling them in. In this review, we focus our sights on the Dragonfly 7 Pro. This fish finder is feature packed. 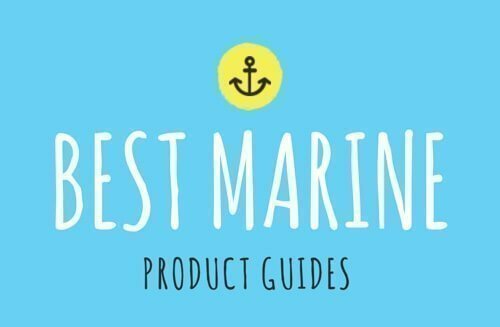 It makes locating fish a breeze and goes the extra mile teaching you a lot about the marine environment underneath your boat. All these in return can help transform you into a better angler. That said, let us get right into what makes the Dragonfly 7 Pro a big deal. The Dragonfly 7 Pro is created to be visually appealing. Its fit and finish are top notch. The body is compact and lightweight. The waterproof display is high quality and thanks to this waterproof technology, the screen does not fog up when it is cold. This fish finder features a rotary dial and three buttons. The reduction in buttons makes it easier to use and operate. You can switch between split screen, GPS and sonar with your eyes closed; well, not exactly, but you get the point. To select the preferred screen, you can navigate using the rotary dial. You should note that this Raymarine fish finder is an affordable option. It works well in both fresh and saltwater. 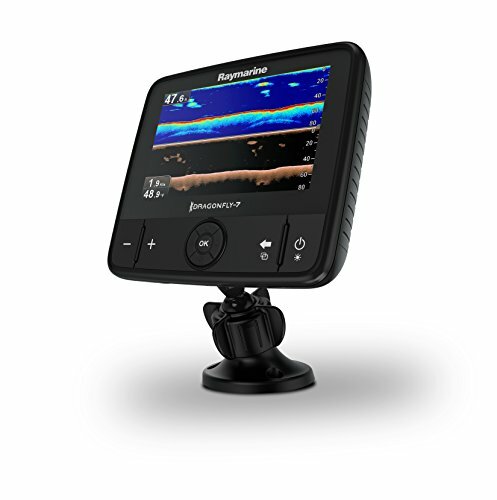 The Raymarine’s exceptional performance has led to it being ranked as one of the best fish finders on the market. Very few fish finders perform as advertised let alone surpass the users’ expectations. The Dragonfly 7 Pro is, however, an exception. The color CHIRP DownVision technology is exceptional on this unit. The results displayed are impressively detailed. You can view fishes of all sizes as well as underwater structures without challenges. With the Dragonfly 7 Pro, you can see the fish even if they are hiding under columns and water structures. This allows you to strategically position your boat and bait to attract your target. Locator operation is straightforward. All you need to do is turn the device on and start locating your fish. There is no device setup that is required. Furthermore, the fish finder’s mount is adjustable, and it can be installed on pretty much any surface very easily. The display screen on the Dragonfly 7 Pro fish finder is brighter and crisper. The screen is constructed from bonded LCD. This material offers brighter colors, a sharper contrast and a higher resolution than other types of screens. The screen measures 7-inches and has an 800x480 resolution. One can comfortably view the screen even under direct sunlight. This review would be incomplete without the mention of the CHIRP technology used in this fish finder. This CHIRP Sonar technology makes this Raymarine unit stand out from the rest of the fish finders on the market. With the Dragonfly 7 Pro, you have the opportunity to choose between 2 CHIRP channels. The first is used for fish targeting while the second provides a wide 60-degree CHIRP angle DownVision image. The fish targeting scans of the waters below the boat go out at a 25-degree angle. It is designed to target bait and larger fish. The 60-degree CHIRP angle on the other hand provides lifelike images of structures underwater. The DownVision CHIRP mode trumps almost every other fish finding technology. It allows you to see details in the craggy bottom. At the same time, it offers impeccable target separation between fish and structures under water. All in all, this technology is accurate and provides great imagery. Now let’s see how the Raymarine Dragonfly 7 Pro compares to the Lowrance Elite 7 CHIRP. But before that, here is some information you need as well as some of the most commonly asked questions. 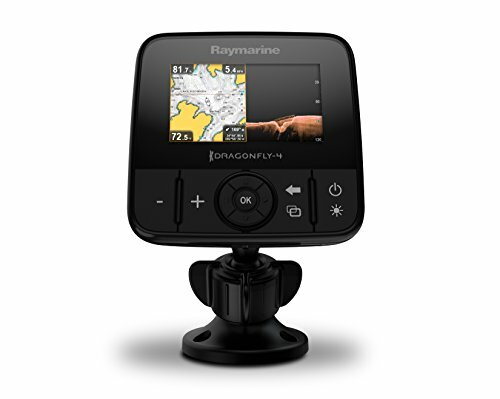 Q: Does the Dragonfly Pro allow way points and map views? Q: What is the difference between the Dragonfly 4, 5, & 7 other than price? A: Screen size and resolution. The 4, 5, & 7 correspond to their screen sizes. The Dragonfly 5 and 7 both have a 800 x 480 display while the Dragonfly 4 has a 480 x 272 display. Q: Can I buy the smaller smaller screen version (Dragonfly 4 Pro) and use the app to stream to a tablet to save money? A: Yes, you can however keep in mind that you will now have your tablet on the boat which is not water proof and you will also need a charging cable as streaming will deplete the battery very quickly. Q: Is the Dragonfly Pro hard to install? Q: How fast can I go and still get good depth/fishing readings? Q: Does the Dragonfly Pro come with a sun cover? A: No, but we recommend purchasing one if you are going to leave on your boat. A. This is an Italian company that is dedicated to the manufacture of navigational charts (electronic). The company was created back in 1984 and so far has a wide range of products under its wings. Dragonfly 7 PRO is equipped with a GPS receiver and ships pre-installed with the Navionics + charts. The maps cover the entire coastal US and Canadian waters as well as a growing list of 20,000 lakes in it. This allows you to be able to take this fish finder on almost any body of water and know you will not get lost. If you are wandering what the difference is between the 3 PRO models, we will explain it here. The main difference is only the screen size. The 7Pro has a 7.0 inch 800 x 480 resolution display; 5Pro has a 5.0 inch 800 x 480 display; and a 4Pro has a 4.3 inch 480 x 272 resolution display. All other specs are identical. The larger display will make viewing images on the display a lot more convenient and faster. If your budget allows it, go for the 7.0 inch 7Pro model. 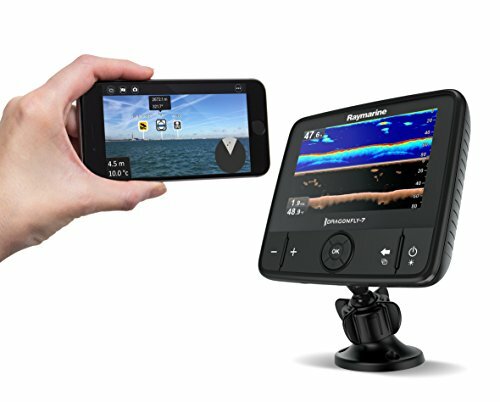 The debate as to which is better between the Raymarine Dragonfly series and the Lowrance fish finder series is popular, and with every new fish finder, it gets more heated. These two fish finders have a lot of features in common. This may make it difficult to choose one over the other. Nonetheless, if you look closely, you will notice some differences. For instance, the Dragonfly 7 Pro features an all-weather display while the Lowrance Elite 7 does not. The Lowrance Elite 7 comes with a sensitive antenna to help the GPS system function even better while the Dragonfly 7 does not. While each of these units has CHIRP technology, the Dragonfly 7 pro has the upper hand. How so? Well, it features a dual CHIRP Sonar which contains DownVision CHIRP and 2D CHIRP. 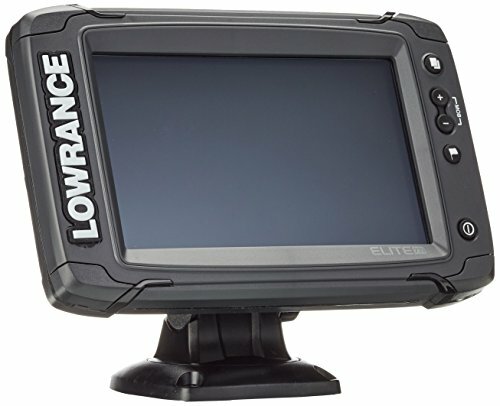 The Lowrance does not have these advanced features which enable the Dragonfly 7 to produce much clearer and detailed images. When reviewing this unit, one word comes to mind – versatility. The Dragonfly 7 Pro Fish finder features an adjustable mount making it easy to install and remove on boats and kayaks. Its instructions are easy to read and understand. In addition to that, it has a great GPS for the angler who is out on the water often and wants to mark favorite fishing spots or set way points during their fishing trip. This is truly one of the best units for anglers currently available; get yours today!